Photo: Harry S. Truman House, (ca. 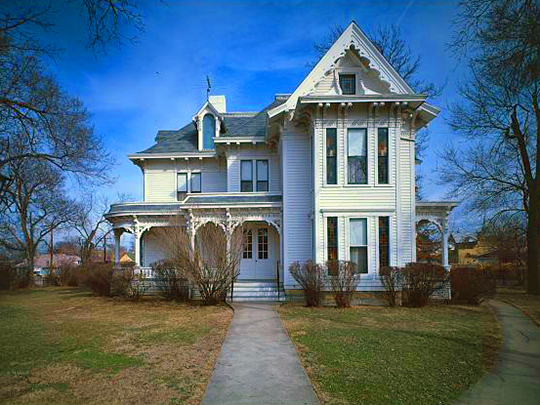 1850), 219 North Delaware Street, Independence, MO, a National Historic Landmark. Listed on the National Register of Historic Places in 1984. Photographed by Jack E. Boucher, 1983, Historic American Buildings Survey [HABS MO-1175-124], memory.loc.gov, accessed May, 2014. The Jackson County Courthouse is located at 415 East 12th Street, Kansas City, MO 64106; phone: 816-881-3333. The county was organized December 15, 1826, from Lillard (now Lafayette) County and named for United States President Andrew Jackson. Jackson County is located on the extreme western border of Missouri, 160 miles from the southern line, and 112 miles from the northern line of the State. It is bounded on the north by Clay and Ray Counties, separated by the Missouri River, on the east by Lafayette and Johnson, on the south by Cass County and west by Johnson County, Kansas. The first settlement in the county was made in 1808, and there continued to be new arrivals from that time until the organization of the county, December 15th, 1826. The History of Jackson County, Missouri, Union Historical Company, Birdsall & Williams & Co., Kansas City, MO, 1881.